The earliest account of Slavs living in the area that is today known as Bela Krajina (eng White Carniola, germ Weisskrain) likely comes from the Chronicle of Fredegar of 623. It is unclear whether the Windic March named in his chronicle extended south to the river Kolpa but later maps to show the river as the southern border. If not, the region was an unclaimed area between the realms of the alpine Slavs (ancestors of today’s Slovenes) and the Croats to the south. While Carniola (today’s Dolenjska, Notranjska and Gorenjska) likely fell under Samo’s kingdom until his death in 658, the Windic March to the south was disputed between the Franks and the Croats until the establishment of the March of Carniola under the reign of Charlemagne in the 9th century. Later, the Treaty of Verdun in 843 allocated the Windic and Carniolan Marches to the greater March of Carinthia. 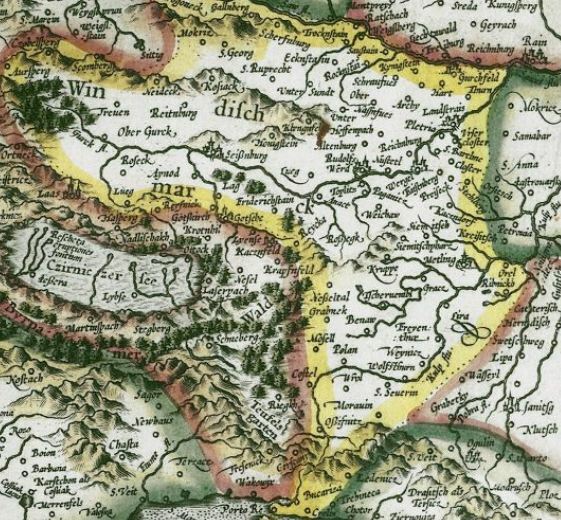 By the 10th century, Carinthia had become a duchy under which the Windic March was subject. During this period, there was likely a church built in Črnomelj on the site of the church of Sts. Peter and Paul. Archeological finds of Slavic burials on the site attest to this. In 1040, the Duchy of Carinthia was subdivided, the Duchy of Carniola established, and the Windic March ceded to the latter. The Duchy also included Innerkrain (Notranjska) and the area north and west of Stari Trg ob Kolpi in western Bela Krajina. Until 1127, the territory continued to be disputed between with the Kingdoms of Croatia and Hungary and the Holy Roman Empire. The religious lives of the inhabitants were controlled, however, by the Bishopric of Zagreb (established in 1094), and it is likely some churches were built under that auspicious. The western part of the region was controlled during this time by the Counts of Turjak from the castle in Poljana (today Predgrad, near Stari Trg), and under an older parish headed in Cerknica. The oldest church in this area was likely St. John the Baptist in Sinji Vrh, built in ca.1050 along with a stately manor — before any church was built in Stari Trg and before the erection of the Castle Poljana in ca. 1250. Beginning in 1127, forces from Carinthia and Carniola in the north, setting their sights southward to the sparsely populated primeval forests of the Windic March, conducted successful military campaigns. By 1200, the area was politically administered by the Counts of Višnja Gora (Weichselberg) and by some accounts, named the Province of Metlika since their seat of power was in Metlika. Soon, these counts began to use the term Weisskrain (White Carniola, slo. Bela krajina) to define the territory, either for the predominance of birch forrests in the region, or the colour of the clothing worn by peasants. In 1248, upon the fall of the Turjak dominions, the area north and west of Stari Trg ob Kolpi was joined to the Windic March. This began a 200 year long peace in the region that allowed for the development of villages, markets and trade with neighbouring dominions. It was at this time that the border with Croatia came to its final resting place along the river Kolpa. New villagers started arriving in a wave of intensive colonization. Slavs came from Carniola and Carinthia, alongside ethnic German peasants and members of Austrian aristocratic families. This is attested to by early land registers (lat. Urbariae, slo. 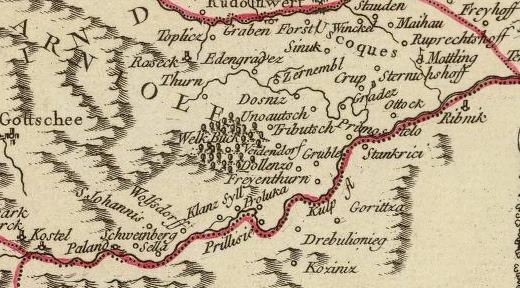 urbarji) that name peasants and landowners with typically Central and Alpine Slavic surnames such as Novak, Žalec, Grahek, Kočar, Urbanec and Zajec, and Germanic surnames such as Wolff, Prokšelj, Šveb, Žugelj and Augsperger. Prior to 1228, only five churches are documented in the region: Metlika (Tri Fare), Črnomelj (St. Peter), Vinica (Holy Cross), Podzemelj (St. Martin), and Semič (St. Stephen). There were also two churches in western Bela Krajina: one in Stari Trg (Holy Cross) and another in Sinji Vrh (St. John the Baptist). This lack of churches indicates the sparsity with which the region was populated. The religious life of the inhabitants in eastern Bela Krajina was still controlled by the Bishop of Zagreb, and by the Bishop of Aquileia in the west. However, the churches in these towns were put under the control of a new parish created by Patriarch Berthold of Aquileia in 1228, whose seat was at St. Peter’s Church in Črnomelj. The churches in the west (in Stari Trg and Sinji Vrh) were included in this new parish in 1248. By 1296, the region had already been divided into at least three parishes: Črnomelj, Metlika (at Tri Fare) and Poljana (at Stari Trg). By 1334, 7 parishes existed: Metlika, Žumberak, Podzemelj, Črnomelj, Vinica, Semič and Stari Trg. The necessity to create more parishes is evidence of the population explosion during the 13th and 14th centuries. The 200 years of peace ended upon the arrival of the Turks at the beginning of the 15th century. The following two centuries saw massive movements of population in and near the Habsburg Military Frontier. Many small villages in Bela Krajina were at least partially depopulated by people fleeing northwards away from Turkish incursions. This period also saw an influx of refugees and military deserters from the Military Frontier who settled along the banks of the Kolpa in and around these depopulated villages. Moreover, military generals from the south (e.g. Lenković) encouraged their soldiers (Uskoki) to move along with their families and establish a new line of defense along the south edge of Bela Krajina (e.g. along the river Kolpa and on the south slope of the Gorjanci mountains). It is no surprise then, that tax registers of the late 15th century onward begin to list surnames more South Slavic in nature such as Matešič, Šimonovič and Jurkovič. Some of these immigrants came from the Lika region of Croatia and Slavonia. Others came as refugees from further south (today’s Montenegro and Dalmatia). Still others came from Hungary with surnames Bubaš, Čemaš and Košut. Ethnicities were varied (Croat, Serb, Vlach), as was religion (orthodox, catholic) and language (e.g. Čakavian-Ikavian dialects of Dalmatia, still spoken in the Lika region). Their descendants either assimilated linguistically and religiously to the contemporary Slovene culture; others held more strongly to their roots as in the villages of Marindol, Bojanci, Paunoviči and Miliči. The political and religious life of the population of the area was complex because the dominions of counts that peasants were subject to did not coincide with the borders of parishes. Most historical material of genealogical consequence is rooted in church documents and therefore, the borders of parishes are important. Other documents, such as the tax registers (urbariae) mentioned above, and later, land registers (cadastres), are also of great importance. These registers group towns and areas that also do not coincide with parish borders. Land registers (Cadastres) were first enacted in 1748 under the reign of Habsburg empress Maria Teresa. 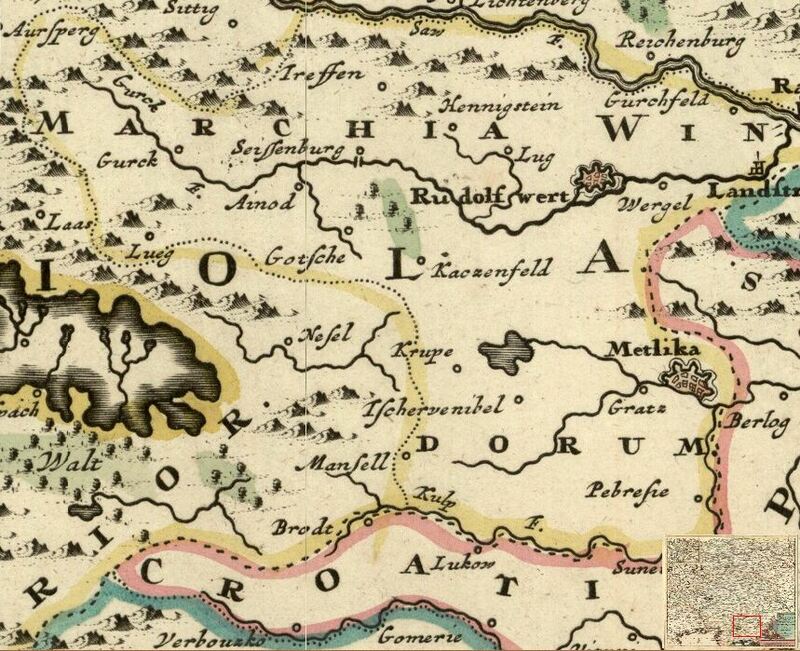 We have not yet surveyed this earliest cadastre, nor have we its successor from 1789, the Josephian Cadastre. The Francisian Cadastre of 1818 is a detailed collection of documents divided into a written component (detailing land use, ownership, area) as well as a graphic component. 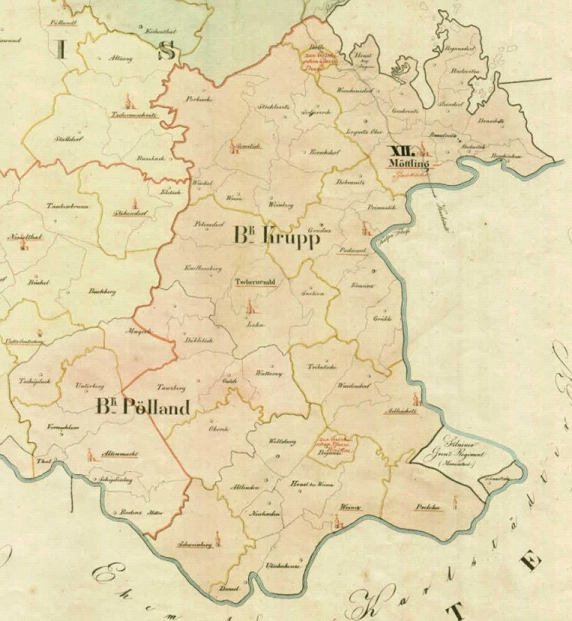 Bela Krajina was mapped in the 1820s and divided into 60 gemeinde (communities), most belonging to the bezirk (district) of Krupp (Krupa) but some belonging to the bezirk of Polland (north and west of Stari Trg). Some communities also had vicinitatiae (neighbourhoods) — internal subdivisions with continuous house numbering within (e.g. Sečje Selo within the community of Učakovci). A vicinitatis could even encompass several villages and hamlets (e.g. Vukovci, Kovačji Grad and Otok all part of vicinitatis Vukovci). The house numbering of the Francisian Cadastre remained in effect until the 1950s. There is evidence of a different system used before this, likely enacted by a previous cadastre. The population of Bela Krajina always worked predominantly, until very recently, in agriculture. Today we use acres or hectares to measure area of arable of land, but in the past, units called Hübe were used in this region (and in most of Austrian and German dominated Europe). A Hübe measured anywhere from 8 to 20 hectares, and was assumed to be the area of land necessary to produce enough crops for one family to survive. In our survey of historical documents, it is interesting to note that the past inhabitants of Bela Krajina very rarely had one full Hübe to their name. It was common for a family (or household) to own (or to be entitled to farm) 1/2, 1/3, 1/4 or even less of one Hübe. As a result, the history of the region has always been set in a background of what we would today consider poverty. With the expansion of industry in the New World in the mid 1800s, the poverty of rural life drove young men to seek their fortunes in North America. And so again we see a mass exodus of individuals (and also entire families) to places such as Pittsburgh, Montana, Nebraska, Minnesota, Illinois and British Columbia in search of work.